Sadly, fire, flood, illness, and even job loss are all a part of the drama of human life. To relieve the distressed is one of the principle virtues taught in Freemasonry, and consequently our fraternity has a long and proud tradition of caring for each other in difficult times. Historically, an Almoner has been a Christian Church functionary, whose duty it was to distribute financial relief to the deserving poor and the term came into common usage sometime in the middle of the 13th century. To this day, the Almoner remains an important and active office in the Scottish Rite and serves as the contact for members seeking relief. It is the Almoner's duty to look after the welfare of our members, including visits to the sick and elderly, and to care for the needs of his brethren during their time of need. But he does not stand alone in this endeavor. Sometimes we are called upon to help a brother maintain the necessities of life in time of dire need. Or we may assist a brother's widow as she struggles to manage her husband's end-of-life affairs during a time of great stress and grief. 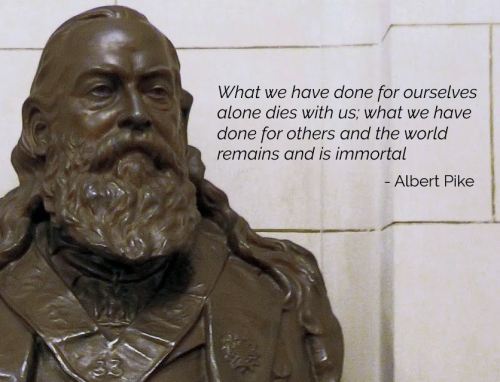 The Almoner's Fund helps Scottish Rite Masons fulfill their obligations, not only to the members of the Scottish Rite, but to all of our brethren in Freemasonry. So how can you help? Please keep your eyes and ears open, and if you see or hear of any of our brethren who may need financial assistance, please contact the Denver Consistory office to make your Almoner aware of the circumstances, so that he may assist the worthy distressed brother and his loved ones. All referrals to the Almoner are confidential and under no circumstances does the Almoner disclose the identity of anyone in distress so as not to cause them embarrassment. And as always, you can make a donation to the Almoner's fund to help ensure the continued support of our deserving brethren in need. Donations may be made by members at any time or via dues payments, annual appeals, bequests and other gifts. Donations from non-members, non-Masons, private foundations and charitable institutions are also welcome. Donations are NOT tax-deductible. The Almoner's Fund resides with the Centennial Lodge of Perfection which is a 501(c)(10) organization. Donations may be "dedicated" (i.e. to the memory of a loved one). Please indicate dedication at time of payment. Donations may be "restricted" such as for medical supplies or funeral expenses. However, unless specified otherwise, all donations are considered "unrestricted" and are particularly appreciated as this allows the Almoner the flexibility to disburse funds for the most effective purpose on behalf of recipients. Donors may remain anonymous upon request. Please indicate this preference at time of payment.